The air courier, air cargo and sea courier rate is calculated according to the gross weight or the volume of the shipment, whichever is higher. The volume, which is also known as volumetric weight, can also be called the volume ratio 1:6 or 1m3 = 167kg. That means you either pay for the weight or the space necessary for the transport of your package. In the case of volume, the largest rectangular dimensions apply. 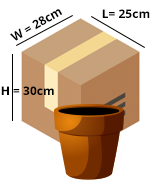 The packages must be measured at the outermost points and the cm figures rounded to whole numbers (e.g. 34.2cm = 35cm, 50.5cm = 51cm, etc.). 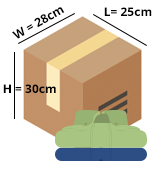 The result is rounded to either half or full kilograms, depends on the shipping method you choose. For air cargo, in the case of several packages, the results are first rounded and then added. For air courier and sea courier, only one package is allowed on a single consignment note. Consolidation might not involve repacking multiple packages into one box when packages shape is inconsistent or some packages are oversized and each package will bear the burden of an initial charge.